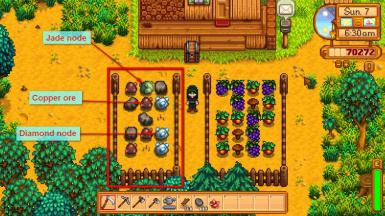 Spawns ores, geodes and gems on your farm with high configurability. Added dangerousSettings option. It removes some some config checks and enables "All" soil type setting (also possibly ruins balance). Added a check for warp points to avoid blocking location's entrances/exits with spawned objects. The locations list variable is cleared on loading a save to avoid checking locations set for a different character. Added an option to use different location specific settings by making a "%" entry in the "Areas" list for a given location. Merged "includedAreas" and "excludedAreas" into a single "Areas" field. Inclusion/exclusion now are specified by '+' or '-' before coordinates. Removed "spawnOres", "spawnGeodes", "spawnGems", "spawnMysticStones" settings. To stop corresponding objects from spawning it's enough to set their chance to 0. Made config file tied to character. Now there is no need to move config file around when switching to a character with a different farm layout. Added an option to enable spawning items on maps other than Farm. Added a config option for Mystic Stone spawn chance. Because why not. Changed UniqueID in manifest file to recommended format. Added an option to exclude areas from spawn. Added base spawn chance for each ore to config. Reworked settings defining a spawn area. Now it is possible to select several areas. Reworked spawn area definition and tile selection code. Fixed bug that prevented spawning ores and gems. Added "discovering" new mineable objects (respawning rocks as new items) with shipping ores/gems and/or raising mining skill level. Added "verbose" setting to configure the amiunt of messages logged to console. Added "skillLevelCorrelation" (lock certain ores/gems from spawn until required skill level is reached) and "personalExperienceCorrelation" (lock certain ores/gems from spawn until they are found and shipped) settings. Added "bonusPerSkillLevel" setting to affect the number of items to spawn. Replaced "initialSpawnChance" with "baseNumber" to make the setting more understandable and give more stable results. Removed "explodeValuables" option to avoid confusion when using "Mining with Explosives" mod. All items except Mystic Stones can be destroyed with bombs. Changed "soilType" setting to accept several values. Items can now spawn in the grass (not just a tile with Grass property) and on hoed tiles. Removed restriction to Hill-Top Farm map completely. Updated the code to be compatible with SMAPI 1.0. Removed deprecated SMAPI methods. Removed restriction to Hill-Top Farm map. Now can be used on all farms. Added the setting for tile properties where objects can be spawned. Available values "Dirt", "Grass" and "Diggable". Added the fluctuations to the spawn chances based on character mining level, daily luck and the deepest reached level in the mines. Fixed conditional statements that locked the spawn of gems to be dependent on the mine level regardless of the option setting. Added the option to turn off the spawn of ores/geodes and turn on the spawn of gems/mystic stones. Added settings to alter the chances for certain objects to spawn. Used (almost) unaltered code from the game .exe for spawning ores on the HIll-Top Farm map. Added the option for setting custom coordinates to define the spawning area. The mod is restricted to Hill-Top Farm map. Improve the quarry of the Hill-Top farm. 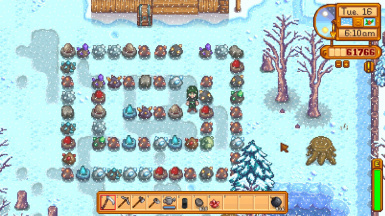 Or make your own quarry on any farm map. Or make the whole world just one giant quarry! 1. Set your own coordinates for the quarry. 2. Set what types of items you want to spawn. 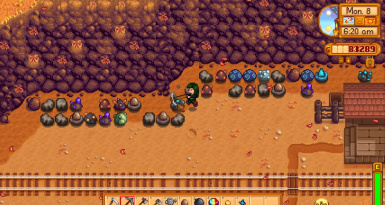 There are ores and geodes that spawned originally, and also gem nodes and mystic stones that didn't. All spawn chances depend on daily luck and most of them on your mining skill. 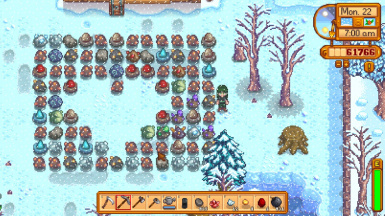 chance for iridium ore and quintuple (x5) the chance for mystic stone. More details in the included readme file. 1. While v1.6 added an option to configure spawn chances for every ore separately, for the sake of balance I don't recommend changing them. Also keep in mind that config shows only base chances that are further modified by different factors. 3. For better experience recommended using together with "Mining with Explosives" mod. 3. Load a character to create a config file for that character. 4. Close the game and tweak configs to your liking. If you want to reset all settings to default, delete existing config file and the next time you load the game a new config will be created. 1.1 Using tIDE. The obvious downside to this method - you need to read how to unpack/repack map files and how to use tIDE - so, unless you already have experience making custom maps, this method is not recommended. 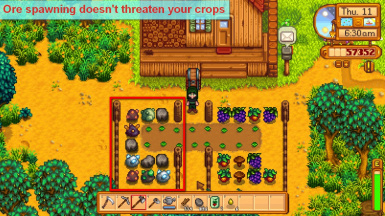 1.2 Using Stardew Valley planner. Upload your save file, toggle coordinates in options and they will be shown at your cursor position. Downside: Stardew Valley planner doesn't work with custom maps (it will show one of the standard layouts), so if you're using custom map this method isn't really good. 1.3 Using debug mode. Since SMAPI 1.1 turning on debug mode requires this mod. 2. Set soil type for tiles where ores can spawn. There isn't uniform best answer for all the maps, but generally using "Diggable" will cover the most tiles, though on the forest map "Grass" is also a viable option. 3. Set the probability of getting a certain type of item with item specific chance settings. 4. For more detailed description of config options read included readme file. Seriously, read it.